To select the type of sort you wish to perform, press either Ctrl+T, click on the toolbar button , or go to the Options menu selection and choose Sort Type. The four sort choices available to you are described below. Only ID items are available as sort keys when this type of sort is used. Note that data files created by CSPro are organized this way. This option is similar to the sort above, and is also used for data files that are grouped by questionnaire. However, this sort type also lets you select sort keys from among data items that appear in single record types. In the above example, if the housing record was a single record type, then its items would be presented as sort keys along with the dictionary's ID items. One use for this type of sort would be where a single record type contains additional information—geographical classification codes, for example—about the questionnaire, but information that isn't part of the questionnaire's identification. You could then sort the data file by these characteristics. This sort option will make an additional key, <record type>, available for sorting. This sort type expands on the case sort (IDs plus single record items) described above. In addition to singly-occurring records, you can choose to sort on one or more items from multiply-occurring records. However, please note if you have more than one multiply-occurring record in your dictionary, you will only be able to choose items from one of the records—you cannot select items from two or more multiply-occurring records. This type of sort can be useful for reordering records within cases. 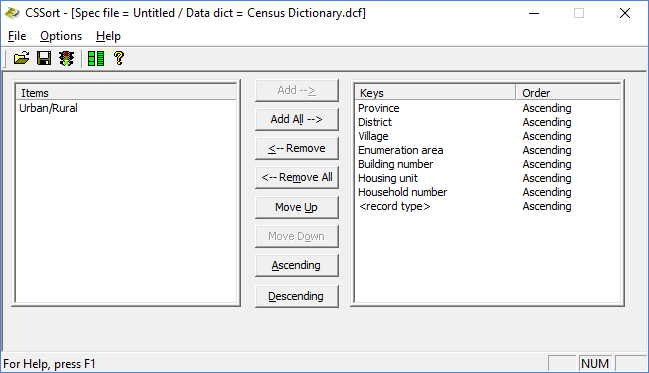 For example, if you were using a dictionary like our Census Dictionary.dcf, and your population records got out of order, you could resort them based on the variable "Line Number." Sort Data will test to make sure that single record types (if defined) are present for each questionnaire. For case sorts, Sort Data will also check for duplicate case ID values. If duplicate are encountered, no sort is done but a list of duplicate case IDs is displayed.